Nazareno Valocchi first appears in the Painesville, Ohio, area in 1915. In America, Nazareno Valocchi was known as Nazareno Valocchi. Nazareno Valocchi, son of Pietro Valocchi and Sarafina Romani, was born on June 9, 1887, at Campli, Italy. He married first, Fioretta DeMattei in 1910 at Philadelphia, Philadelphia County, Pennsylvania. Fioretta died about 1912. Nazereno married second, Margherita Marsili, daughter of Benjamin Marsili and Caterina DiCola, on October 12, 1914 at Wilmington, New Castle County, Delaware. Margherita probably passed away sometime in 1915. Nazareno married third, Malvina Ciappico, daughter of Raffaele Ciappico, on January 15, 1916 at St. Mary Catholic Church, Painesville, Lake County, Ohio. Malvina died in January, 1925. He married fourth, Marcellina Santi in June, 1925 at Cuyahoga County, Ohio. Nazareno died on October 18, 1967, at Conway Nursing Home, Madison, Lake County, Ohio, at age 80. His body was interred at St. Mary Cemetery at Painesville Township, Lake County, Ohio. Nazareno Valocchi, age 16, immigrated to the United States on May 9, 1904, travelling to Philadelphia, Pennsylvania. He was joining his father, Pietro Valocchi in Philadelphia. Nazareno is shown as re-entering the United States on November 12, 1905. He was rejoining his father in Philadelpia. Nazareno Valocchi became a citizen of the United States on September 20, 1937. Nazareno resided at 352 Sanford Street, Painesville, Lake County, Ohio, when he was Naturalized. At the time of death, Nazareno resided at Sanford Street, Painesville, Lake County, Ohio. 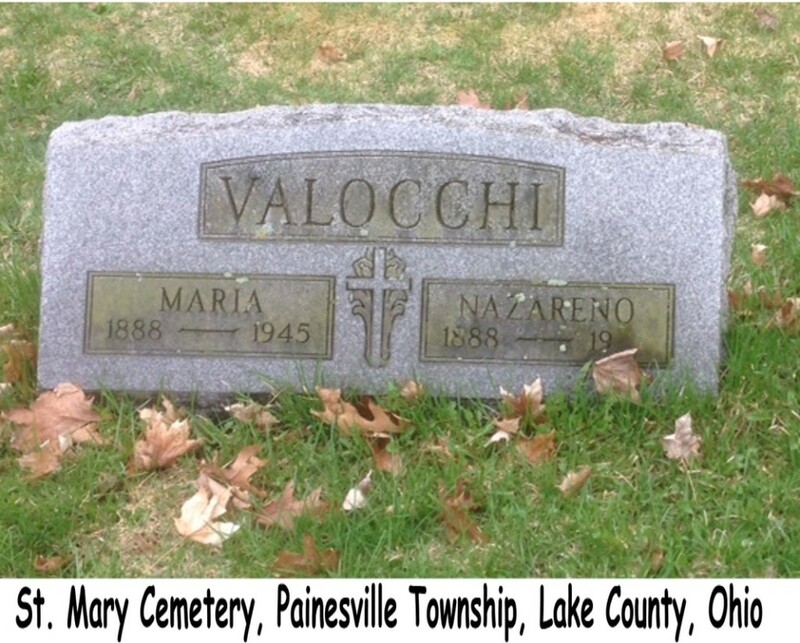 Three of Nazareno’s brothers also lived in Painesville: Vitale from 1913, Mattia from 1915, and Geremia from 1920. 1. Lena H. Valocchi was born on August 3, 1910, at Coatesville, Chester County, Pennsylvania. She married Nicola Ciprietti, son of Antonio Ciprietti, on February 16, 1926 at St. Mary Catholic Church, Painesville, Lake County, Ohio. She married second, Clifford E. Rehberg in 1935 at Painesville, Lake County, Ohio. Lena died on July 15, 1970, at Euclid General Hospital, Euclid, Cuyahoga County, Ohio, at age 59. Her body was interred at Riverside Cemetery at Painesville, Lake County, Ohio. There were no children of Nazareno Valocchi and Margherita Marsili. 2. Florence B. Valocchi, was born on January 26, 1917, at Fairport Harbor, Lake County, Ohio. She married Edward Sylvester O’Leary, son of Sylvester Edward O’Leary and Anne Laughlin, on October 12, 1937 at Painesville, Lake County, Ohio. Edward died in 1944. Florence married second, John Nemeth, son of John Nemeth and Bridget Sackali, on November 10, 1947 at St. Mary Cemetery, Painesville, Lake County, Ohio. Florence died on April 11, 2005, at Manor Care, Willoughby, Lake County, Ohio, at age 88. Her body was interred at St. Mary Cemetery at Painesville Township, Lake County, Ohio. 3. Judy E. Valocchi was born on June 3, 1918, at Cleveland, Cuyahoga County, Ohio. She married Norman C. Reeves, son of Robert Floyd Reeves and Wilhemena Beckenbach, on March 2, 1946 at St. Mary Catholic Church, Painesville, Lake County, Ohio. She and Norman C. Reeves were divorced on January 13, 1956 at Lake County, Ohio. She married second, Eugene Wilson, son of Paul Wilson and Rachel Gardner, on October 31, 1958 at Lake County, Ohio. Judy died on June 9, 1998, at Meridia Hillcrest Hospital, Mayfield Heights, Cuyahoga County, Ohio, at age 80. Her body was interred at Riverside Cemetery at Painesville, Lake County, Ohio. 4. Sistine Valocchi was born on December 14, 1921, at Painesville, Lake County, Ohio. He married Helen Grace Ward, daughter of Leonard Ward and Grace Jennings. Sistine died on February 10, 1972, at Lake County Memorial Hospital, Painesville, Lake County, Ohio, at age 50. His body was interred at St. Mary Cemetery at Painesville Township, Lake County, Ohio. There were no children of Nazareno Valocchi and Marcellina Santi.